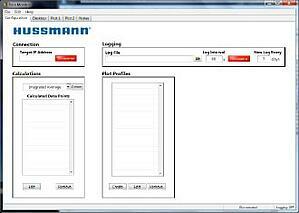 Hussman Data Monitor is a data logging, analysis, and viewing package for monitoring long running refrigerator case testing. The software is highly configurable to adapt to all of the customers data monitoring needs. In addition to displaying the data trends over time there is a function that allows the user to load an image of the device under test and place indicators on the picture where each measurement is made and see live updates of the readings right on the image.